From a design standard, what should a yoga website have that other websites don’t? Whether you’re building a yoga website for a studio, a group, or as a solo practitioner, here are a few features you’ll want to have. A description of your location, directions for getting there, and operating hours. A photo gallery is important for showing the environment as well as the yoga sessions. A blog that offers practice tips for students, like meditation advice or general health tips. Information and news about your business, such as its goals and practices. If a customizable yoga theme is what you’re looking for, keep reading and you’ll be sure to find one that suits your needs. While there are many options available, it’s best to find a yoga brick-and-mortar-based theme because of the extra perks that often come included. Read on to find the top yoga themes of the year. The Mandala WordPress theme is a great place to start since it offers everything you’ll need to build a successful website for your yoga studio or wellness center. It comes with a brilliantly modern design and a robust set of features and modules, such as sliders and galleries for displaying your photos, eCommerce support so you can easily set up an online shop for your studio, and Google Map integration so people can easily find your location. In addition, the Mandala theme offers you several unique homepage layouts to choose from, and a drag-and-drop page builder to easily create custom page designs. You’ll also find several navigation options, custom widgets and shortcodes for expanding your site’s functionality, and extensive documentation and support should you encounter any issues. 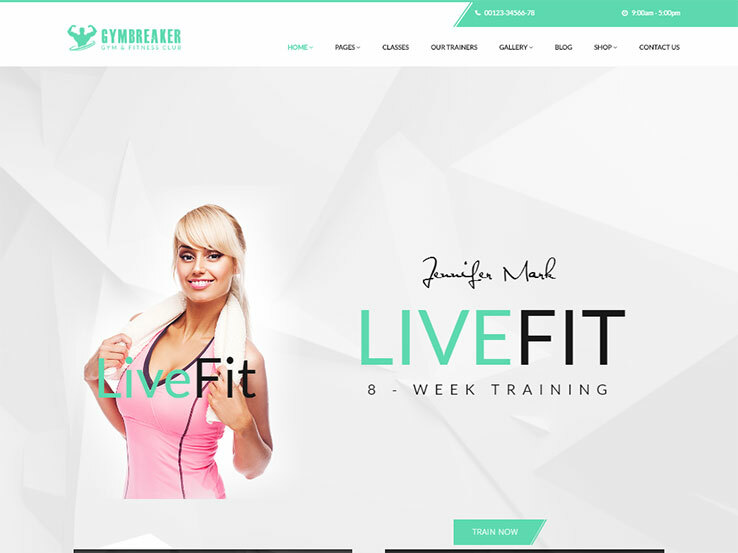 If you’re building your own business or client fitness site, this theme is a good choice. With its custom post types that integrate into the frontpage layout, rotating slideshow, mobile-first responsiveness, unlimited colors and more, this theme will make a great first impression on potential clients. The stylish, youthful theme is sold directly from the WPLook Studio. It has a bold and vibrant color scheme; if you want something more muted, you can easily change it to suit your brand. It’s fully responsive, mobile- and translation-ready, and it has an attractive options panel that lets you unleash your artistic creativity for your website. 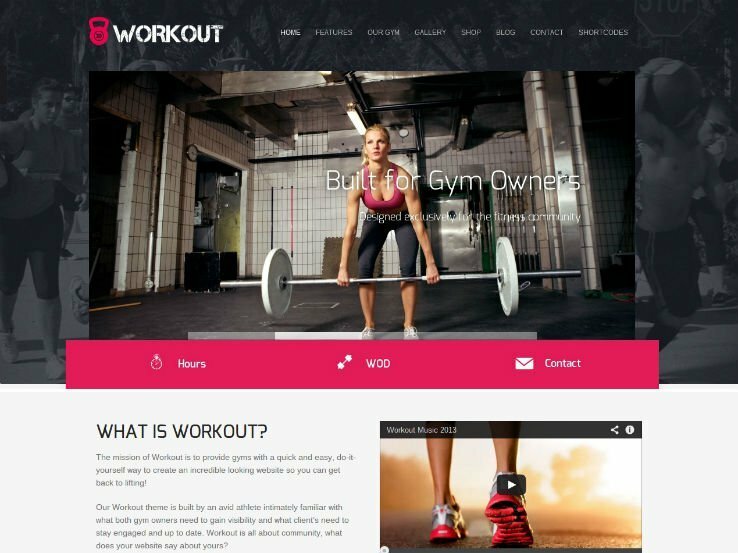 The Workout Theme not only has features like a Workout of the Day custom post type, WooCommerce integration, facial recognition, image cropping, programs and class schedules, and page templates but it’s fun to work with, too! 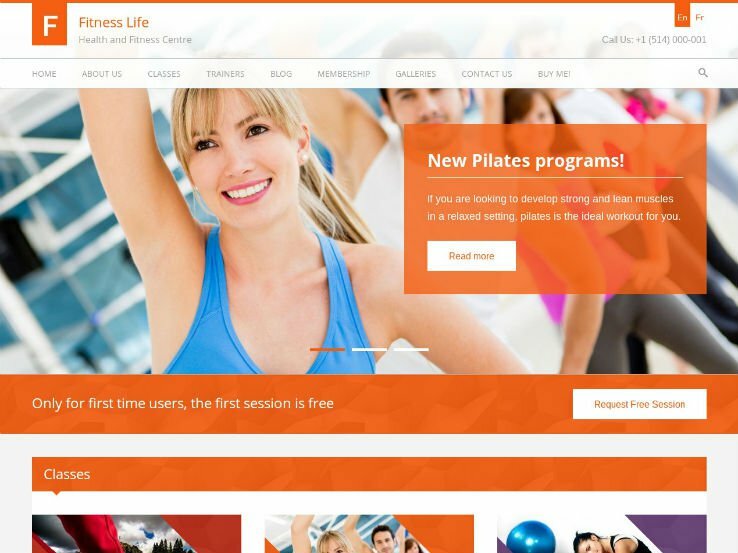 The themes are based on yoga images that have been optimized for gyms, and with a bit of tweaking, they can be easily modified for your own studio business website. An added bonus – this theme integrates with WooCommerce, so you can start selling your own custom merchandise el from your website in a matter of minutes. 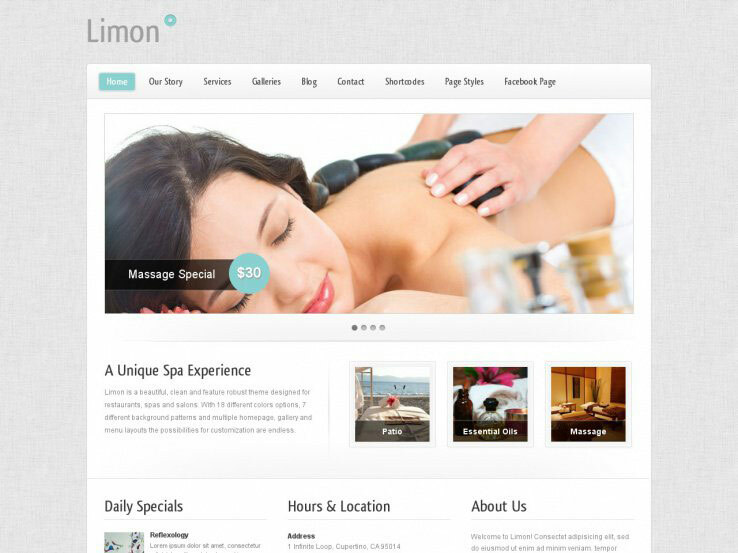 Limon is a feature-rich theme designed with yoga studios, spas, and restaurants in mind. 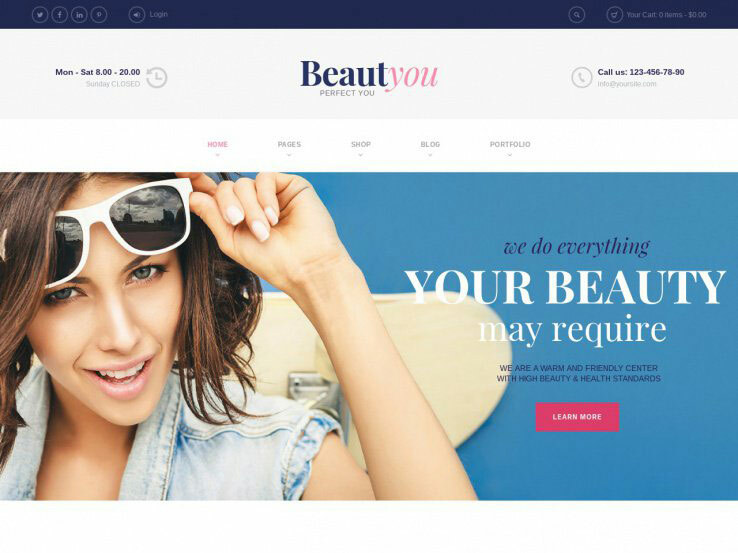 It has an outstanding homepage slider with smooth transitions and high-resolution images; eighteen colors schemes to get the exact look to make you stand out in a crowd; and it includes seven different backgrounds and an extensive theme options panel to customize the design of your website. Add to that the more than 50 shortcodes to add buttons, columns, accordions, and much more, without having to touch a single line of code, and you’ve got a winner. Another feature worth mentioning is the unlimited number of widgets you can add to your sidebar and footer to add additional information about your website or yoga studio. A customizable Facebook page is included with the purchase. 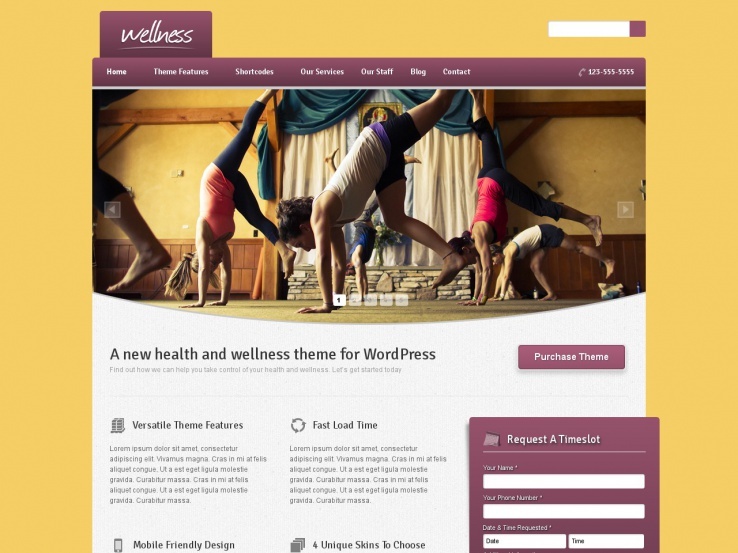 The Wellness theme, made by BWThemes, gives you four health and wellness skins and is an easy way to create the look and feel of your website. The powerful customization panel allows you to change the colors to any color you want. The responsive theme looks great on all devices, and its stunning slider will show off the images of your yoga studio or yoga poses. With SEO optimization and translation options, Wellness will make a lasting impression on anyone who visits your website. The bold, custom request form stands out from the rest of the website and makes it easy for potential students to request a time slot and schedule a class. Finally, Wellness includes plenty of widgets and shortcodes so you can easily customize your website without having to do any coding yourself. 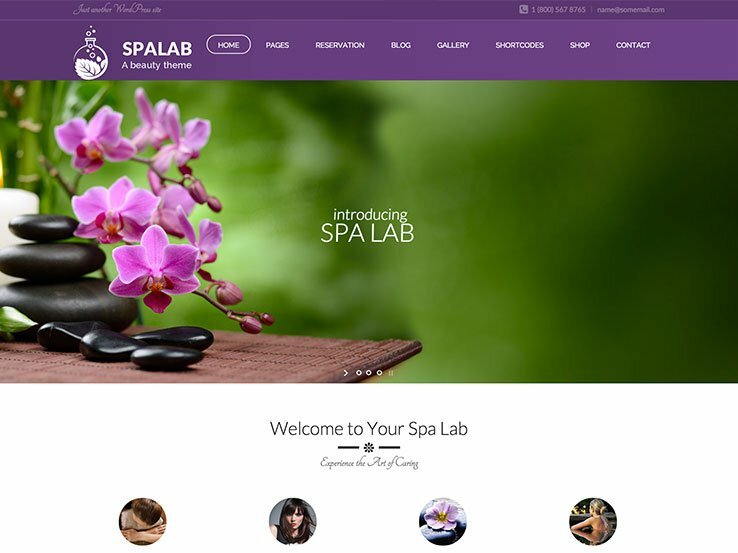 Spa Lab is a sleek WordPress theme with an eye-catching purple color scheme and elegant typography. The design is very feminine and is sure to attract a female audience to your yoga studio. Its visual shortcode generator means you won’t have to manually edit the code – a big plus! Special pages are included for therapists and procedures. The theme’s integration with the Contact Form 7 plug-in makes it easy for your clients to contact you, and with the WooCommerce integration, you’ll be able to sell items like yoga mats and health drinks. You can customize your typography with the included Google Fonts, and the widescreen slider lets you add a text overlay and a button to direct people to your most important pages. With the powerful Page Builder, you can easily create custom page layouts and tweak any of the existing ones. 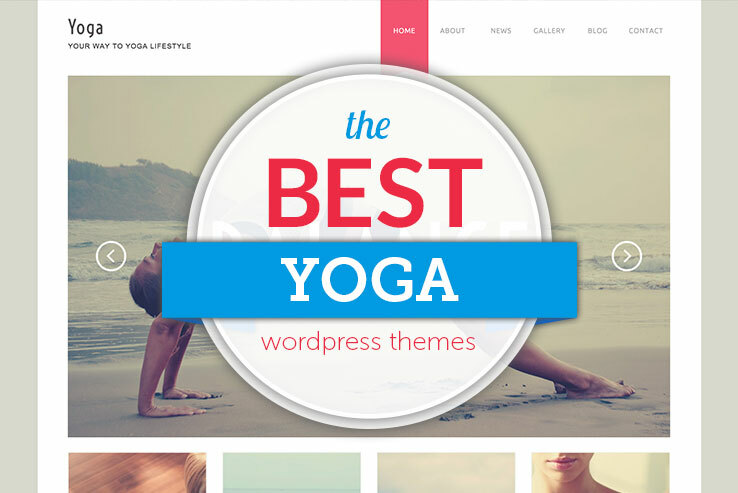 Overall, this theme is a great choice for yoga studios that want to attract a female audience. 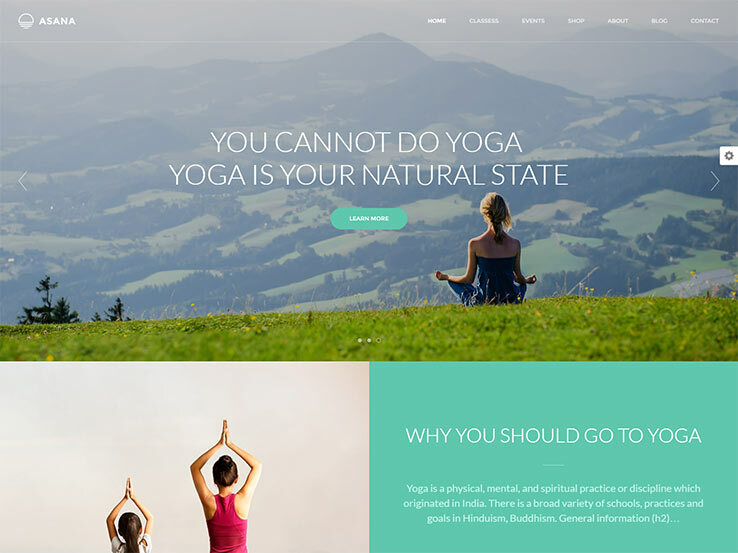 The Yoga theme, sold by the folks by TemplateMonster, features a minimalist white background and an image-heavy front end interface that will bring attention to your studio and students. You can edit the responsive theme from the WordPress dashboard, and the custom post types let you add extra content to attract potential students. The two-step installation is a plus for beginners, and more than 80 shortcodes will keep you from having to do any coding. Customers rave about the stylish, high-resolution slider, and the gallery and blog options are personal ways to share exclusive yoga and wellness tips with your audience. Traffica can be used for all kinds of businesses because it offers six distinct website layouts. It is primarily focused on yoga studios and organizations that promote healthy living. With pre-designed buttons, you can quickly add your business logo, share your services, and integrate your social media links. The widgetized footer lets you add additional information such as your contact details and business hours. The impressive slider will showcase perfect yoga images with descriptions, and with the About Us widget, you can tell customers about your business and share your recent posts. The responsive design includes eight stylish color schemes that are easy to change with a click of a button. 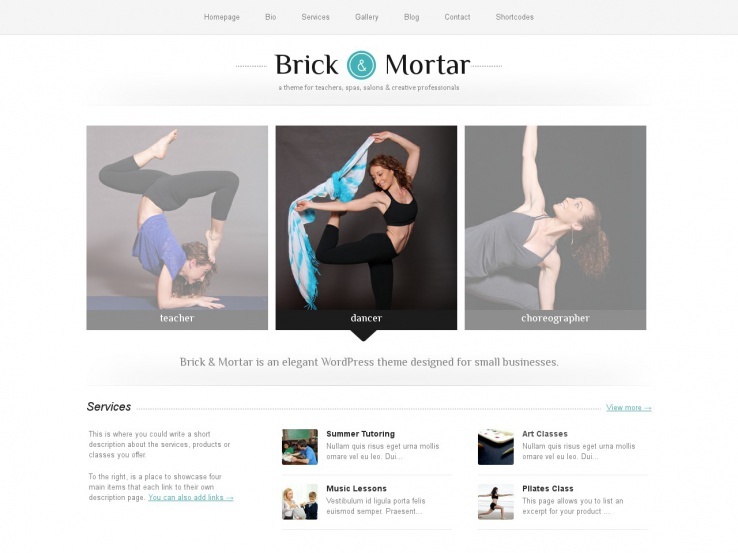 Brick and Mortar theme for WordPress is a simple, clean theme with an eye-catching slider that has multiple styles, a service section, and a blog feed on the frontpage. It’s well-suited for yoga studios and spas as well as other commercial businesses. The theme offers a wide variety of choices, so although it’s primarily designed with yoga studios in mind, you can adapt it to other business niches as well. The theme offers several layout options for the homepage and a few custom templates that are perfect for creating service and product pages. An intuitive, advanced theme options panel allows you to style almost every aspect of your website, and the custom shortcodes make it easy to add additional design elements to any page without the need to touch a single line of code. 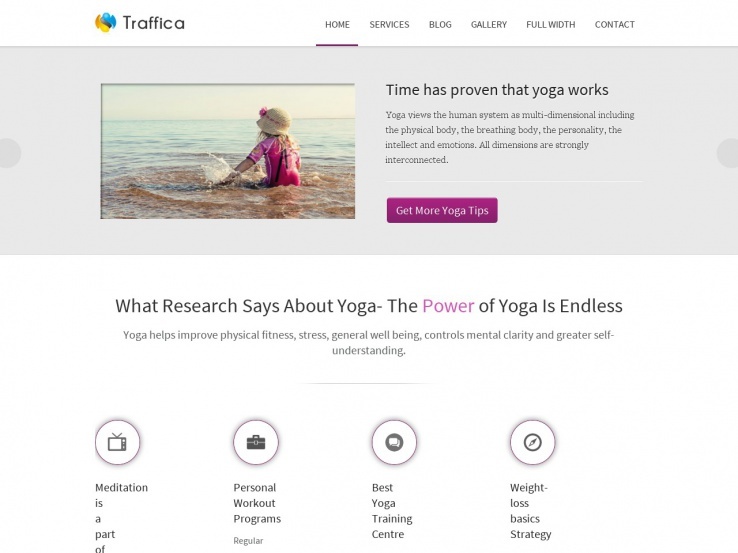 The Yogi WordPress theme has everything you need for marketing your yoga studio. The responsive theme provides a navigational menu that stands out with its interesting colors and designs; a full-width slider will display pictures of your studio or your students in yoga poses; and you can even include social media buttons to connect with your clients and students on their preferred social media platform. The contact modules work perfectly on mobile devices – you just click on the phone number or email address one time, and once and send you a message. The Teachers section is a great way to feature your instructors and highlight their profiles, and you can easily share events, blogs, and news with the dedicated sections. With the settings in the Admin Panel, you can upload your own photos, change the colors, and even improve the SEO. With the Dream Spa theme, you’ll have a lot of flexibility in building an impressive online presence for your yoga studio. The responsive theme is well suited to the yoga niche because of its many features that facilitate the booking process and showcase different class packages. The latest design has a mega menu which lets you add pages to your menu without overwhelming your you or your visitors, and the easy-to-use admin panel is geared toward beginners and advanced users alike. The visual shortcode builder is a bonus, since you won’t have to know how to code elements like buttons and columns. Play around with the unlimited layout possibilities, and use the quick skin changer to find the colors and designs that work best for your brand. Along with HD videos and comprehensive support documentation, the Dream Spa theme is a wise choice for getting your website up and running within minutes. On top of that, the Shop page is top-notch if you plan on selling items through your website. 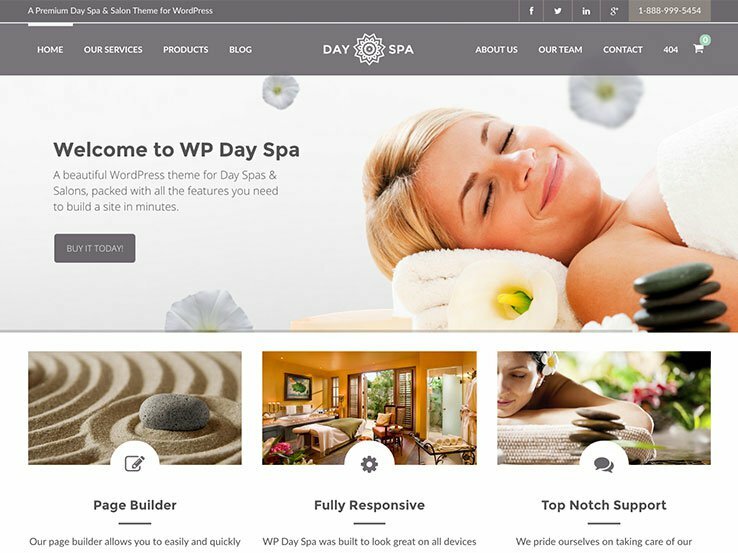 You should take a look at the WP Day Spa WordPress theme if you need a powerful booking system for yoga classes and private sessions. The theme comes with the Slider Revolution plug-in, which is generally sold as a premium add-on. This plug-in offers a wonderful way to share promotions, and it includes several animations and buttons that will grab visitor’s attention and improve your sales. WP Day Spa provides WooCommerce support if you’re interested in selling items like yoga mats and dietary supplements. The unlimited custom skins will brand your site, and the mobile-responsive nature of the theme will make your website easy to see on mobile devices. The theme is SEO optimized, and it has an advanced theme options panel. The translation features will translate your website into any language you want. In addition, the tons of Google Fonts that are provided with the WP Day Spa theme will let you customize the typography of your website with ease. Consider the Beauty theme if you want a modern looking website with online booking functionality. This theme is technically built for salons and beauty parlors, but it can easily be adapted to the needs of a yoga studio. It has all the tools you need to make your studio run smoothly, such as a booking module which makes it easy for anyone to book one of your packages. Beauty has a mobile-responsive design, which means your website will look great on any device. With the Visual Composer, you’ll be able to tweak the layout of any page, whether you’re a beginner or an advanced user. The events calendar can send out notifications for any event, and the one-click installer will get your site up-and-running fast. The best part of the Beauty theme is that it includes 27 gallery styles so you can showcase the photos of your studio and your yoga sessions. Beauty offers WooCommerce compatibility to let you to sell anything from digital to physical products online. In addition, the theme has translation features so you can easily translate your entire website. Check out the Young Fitness theme if you’d like a colorful and fun website. The responsive design displays perfectly on all screen sizes, and you’ll be able to showcase your best photos with the NexGen Gallery. Two homepage options are offered, one that’s designed for trainers, and one that’s designed for companies that sell courses. A mega menu, part of the Young Fitness theme package, makes it easy for you to organize and add all of your pages to your menu, and you’ll be able to design and create different templates for each page with the Aqua Page Builder. You can select one of the six color styles and use shortcodes for anything from buttons to toggles. You can even implement pricing tables to highlight your membership plans. For further customization, a set of Google Fonts is are included, and the portfolio provides filters and various layouts that will make a great first impression on anyone who lands on your website. 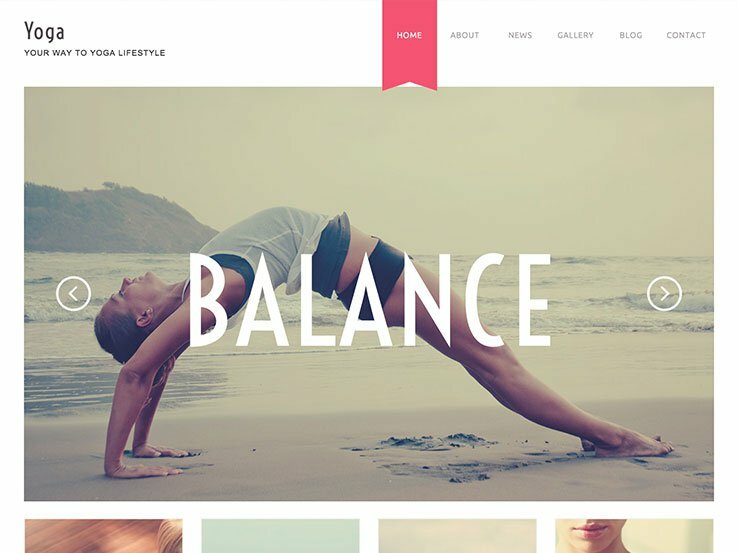 The Asana theme, developed by HighSea, is a stylish theme that’s perfect for yoga studios and sport-oriented websites. It’s fully responsive and comes with Slider Revolution built-in, so you can create sliders that will grab a visitor’s attention right away. It features a grid layout for easy customization, and it integrates with WooCommerce and Ecwid if you want to build an accompanying online shop. This theme comes with a scheduling function to let you display your class schedule with just a few clicks, parallax backgrounds, infinite scrolling, Font-Awesome Icons, Google Fonts, SEO optimization, cross-browser compatibility, CSS3 animations, as well as included updates and support. Asana is a full-featured yoga studio theme that takes the guesswork out of site design by providing a clean, easy-to-use framework to create the perfect website for your yoga studio. The Pure Spa theme is a real beauty, with all the features and functionality you need to build a yoga site, but it can also be used to create a sports, massage therapy, beauty salon, or any other health and wellness-oriented site you can think of. It comes with several demos with one-click import, so you can get your new site launched in a matter of minutes. Features include a full-width slider with text overlays and a grid-style layout for displaying your classes, services, yoga styles, or any other information you want to share. The homepage includes a section for sharing your company’s story as well as an interesting parallax section where you can discuss your studio’s best features, the benefits of yoga, or anything else. 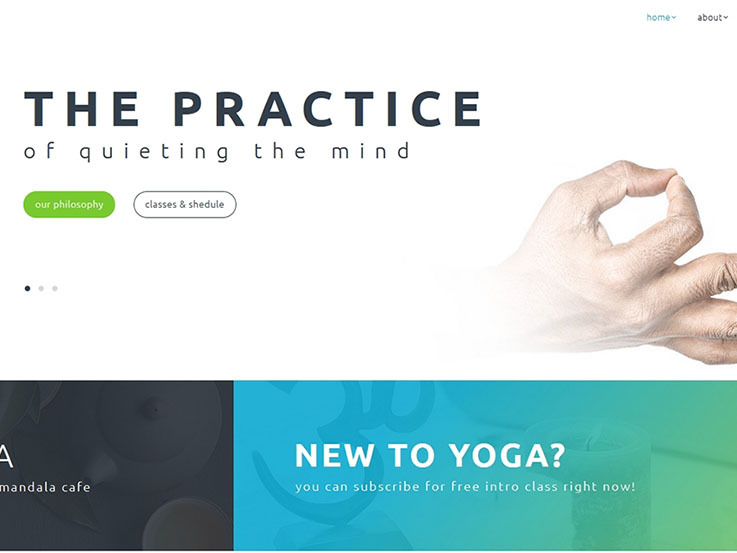 A gallery, pricing tables, call-to-action banners, and an integrated shop complete the features in this theme to make it a worthy contender for your yoga studio website. The GymBreaker theme is perfect for any health club, gym, or sports website, so it’s a no-brainer that you can adapt it to suit the needs of a yoga studio. The feature set is ideal for yoga aficionados and includes: instructor profiles; class descriptions; a “Why Choose Us” section; a stats breakdown of classes, calories burned, or any other important information you’d like to feature; and a program section for going into more depth about the kinds of classes you offer. Other features include galleries, pricing tables, a team member section for highlighting your instructors and other staff, and an easy-to-read class timetable so your future students know immediately what classes will fit with their busy schedules. The theme also includes an events widget, featured products, a blog, a shop, and many other features that make designing your website a breeze. 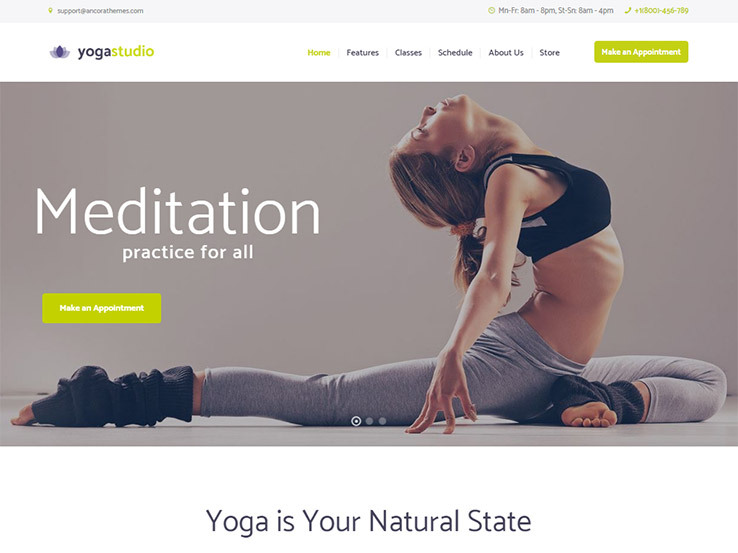 YogaStudio is a beautiful, minimal yoga studio theme that is compatible with a group of premium and free plugins that will help studio owners with setting up a website. AncoraThemes notes that this theme may also work well for other applications such as healthcare businesses or not for profit companies. 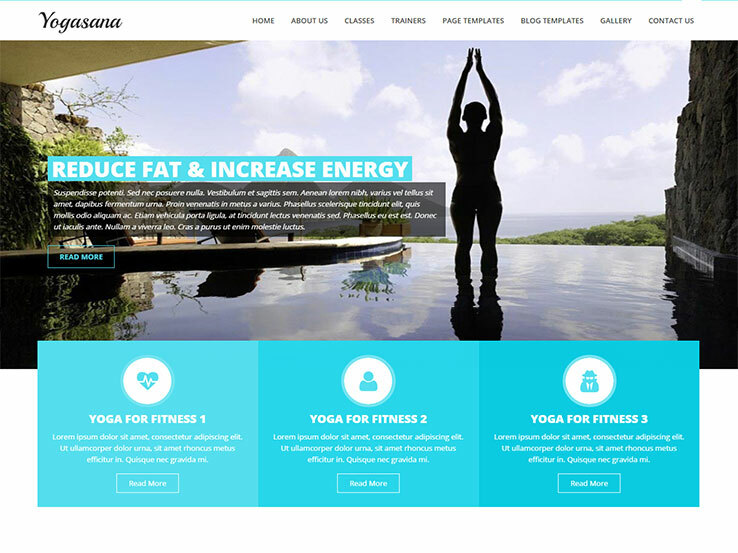 This is a specialized WordPress template for developing yoga studio, group, coaching, or any other health-related fitness website. The minimal design will help you put the primary focus on the content. Thanks to the touch-friendly slider and the responsive design, your yoga site will be accessible from any type of device. Yogastudio allows you to publish a full class routine and schedule for your yoga programs. There are dedicated profile pages for the instructors. The WooCommerce-supported theme also comes with a variety of custom shortcodes and widgets. 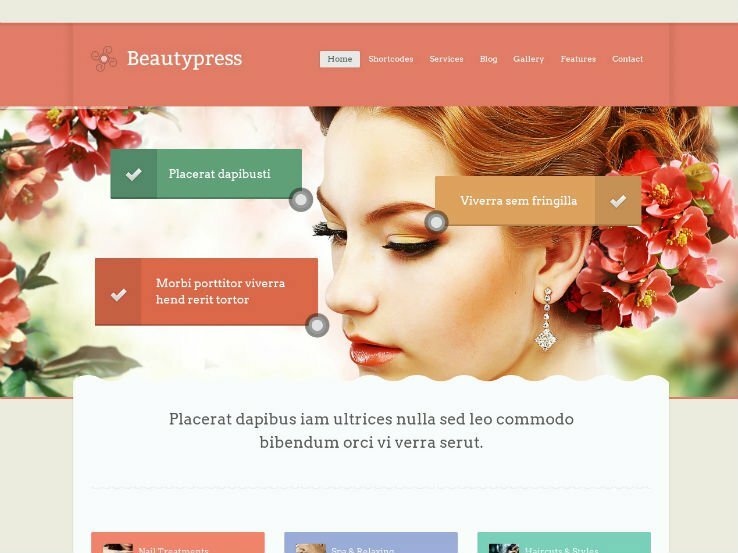 Beautypress is easy to modify if you want to build a fantastic yoga website template, even though it is designed for healthcare, salons, spas, and massage websites. You can use the homepage builder feature to create custom home page layouts in minutes. It’s responsive and ready for both wide-screen viewports and small modern mobile devices. Besides the numerous features it has, the theme comes with extensive documentation and excellent support from Themes Kingdom, so you can be sure you’ll always get help if you need it.